There was a good turn-out for the demonstration at Peterborough Town Hall on Wednesday evening. From 5.30pm onwards, over thirty people gathered in the street outside, to leaflet passers-by, including the elected councillors on their way into the building. Some of those councillors stopped to talk with the protestors. Most of the Tories walked past, refusing the leaflets and the opportunity to learn exactly what Andy Coles’ sordid past involved. The full council meeting began at 7pm. 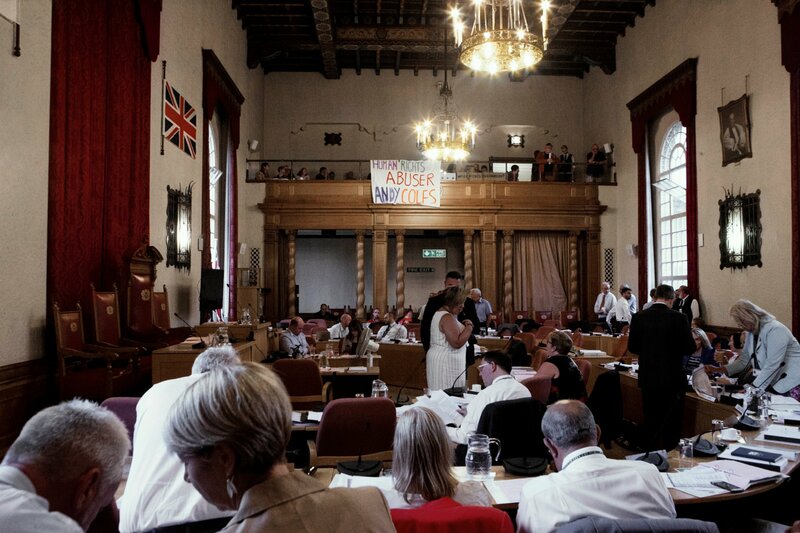 By then, the public gallery was full, with a mixture of Peterborough residents and campaigners from further afield. 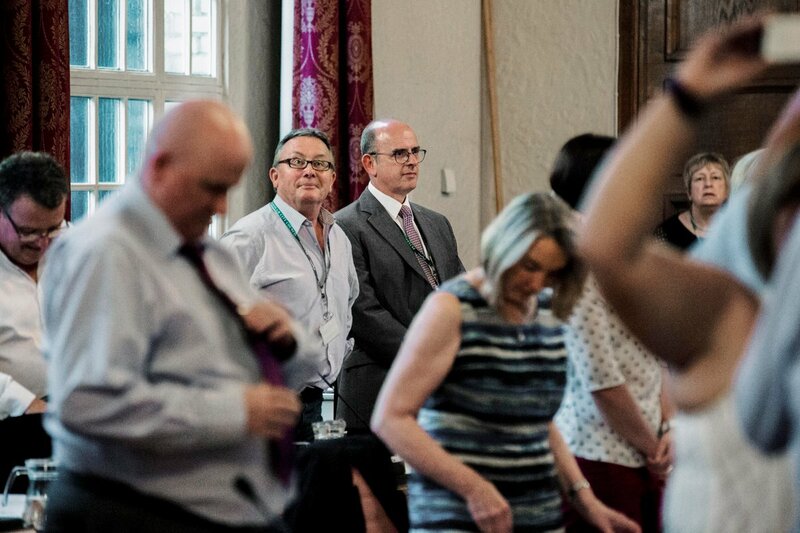 It was a shock to see Andy Coles himself, occupying a seat in the back row of the council chamber beneath. The mayor opened the meeting with a prayer and announcements. When he announced that no Questions had been received, there was palpable disquiet in the gallery up above. Peterborough Conservative Party would dearly love to sweep this affair under the carpet. 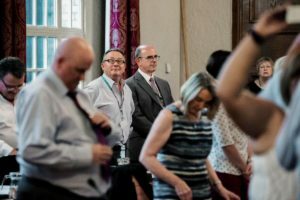 Since the news first broke, they have refused to respond to any questions, or make any comment, beyond Cllr John Holdich, Leader of the Council, stating that Councillor Andy Coles has his “full support”, even though he’s also admitted that he knows “very little” about the situation. In an interview yesterday he added “Unfortunately Cllr Coles is not allowed to speak for himself because the Met have told him he must not say anything and he is obeying that”. The Met have not prevented other ex-undercover officers from speaking out in public, making this excuse barely credible. One member of the public couldn’t resi st raising the issue of the rejected question, which most of the elected Councillors knew nothing about. 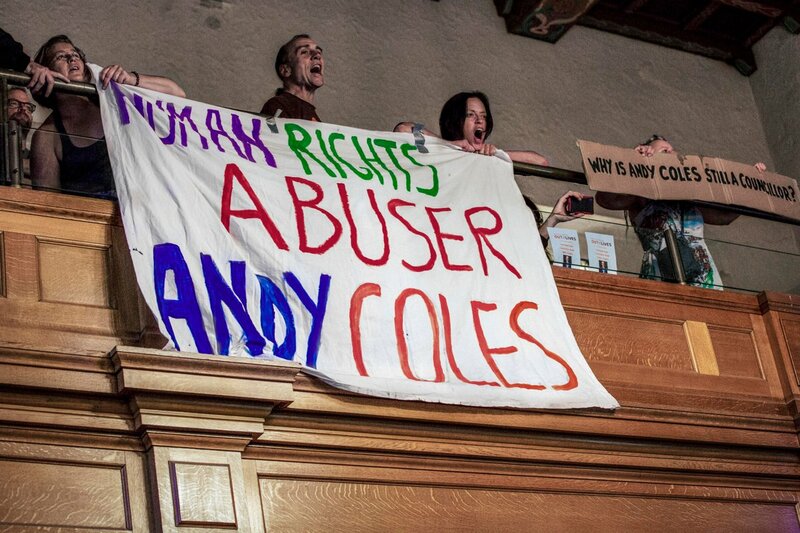 Others joined in, with questions of their own and shouts of “Shame on you, Andy Coles”. A large banner, made by Jessica herself, was draped over the front of the gallery. 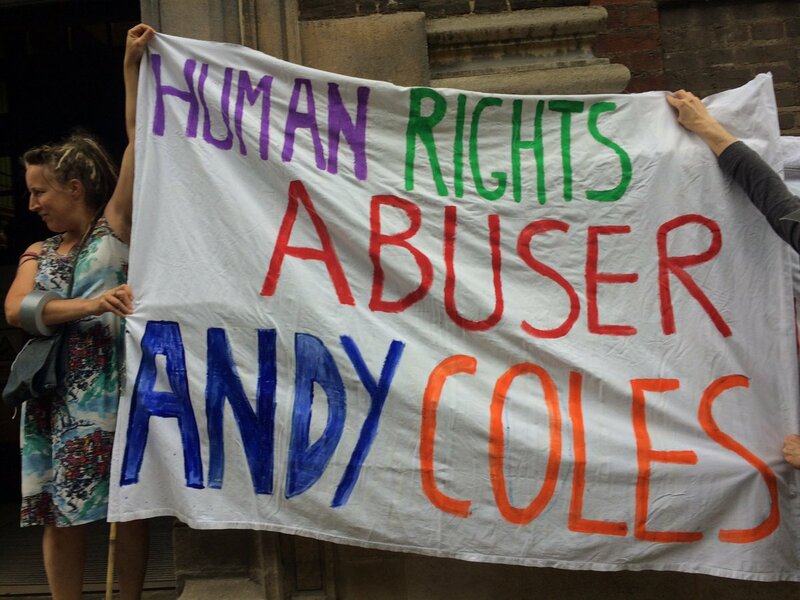 It read: ‘Human Rights Abuser Andy Coles’. There were repeated demands for his resignation or suspension. As soon as the protest began in the gallery, the Mayor halted the meeting temporarily, and sent the (only two) available police officers up to the gallery to ask everyone to leave, or at least make less noise. 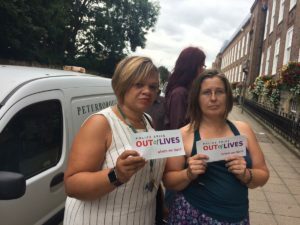 However the public refused to do this, saying they wanted answers to their questions, and the kind of transparency and accountability that Peterborough City Council claim to provide the electorate. Cllr Holdich was unwilling to visit the gallery in person, but did promise to meet with two or three of the group at a later date. Jessica is now planning to go and demand answers from him herself. 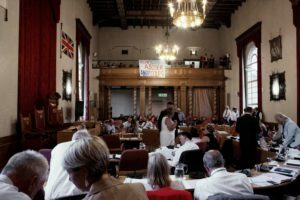 Meanwhile the Mayor didn’t care much for some of the new decorations adorning the chamber, and asked for Jessica’s colourful banner to be taken down. He received a simple response from the gallery: the banner was staying up while Coles remained in the building. But if he was sent home, then the protestors would go home too, taking the banner with them. People feel very strongly that Coles shouldn’t be allowed to carry on with business as usual. It’s standard practice to suspend people from work while allegations of their misconduct are being investigated. He shouldn’t be sitting smirking at the back of the chamber while serious concerns are being raised about his suitability for any position of trust and accountability. Why are the Tories so keen to hang on to Andy Coles? They are no longer in overall control of the Council. Losing just one member will make it even harder for them to operate. However they are playing a dangerous game. The people of Peterborough are angry, and sick of being ignored. Even traditional Tory voters are disgusted at what Coles has done, so this is harming his party’s chance of gaining votes in any future elections. 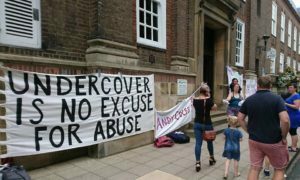 The truth about these abusive spycops units began to come out with the exposure of Mark Kennedy way back in 2010. Since then, activists have done lots of digging, and managed to piece together more information about these units, the officers who worked in them, the spy–craft techniques they employed, and much more. 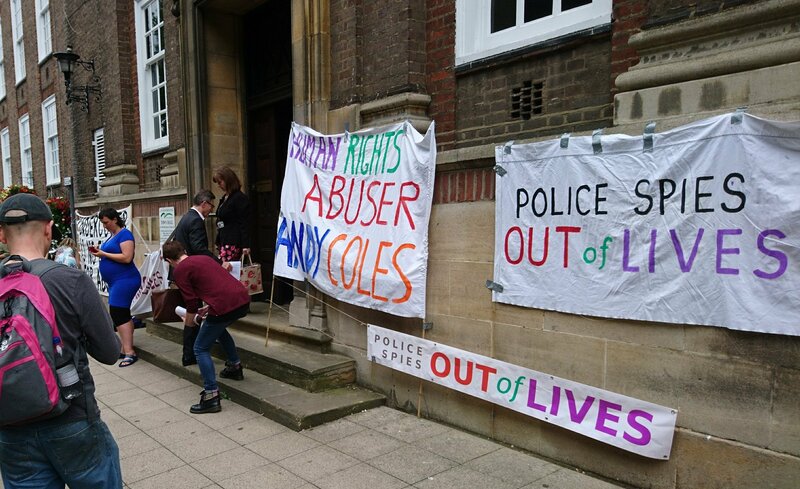 There are now full profiles of many former officers – including Coles – on the Undercover Research Group website. The Government set up the Public Inquiry into Undercover Policing back in 2015, and it’s inevitable that more of the truth will be uncovered as the years go on. Coles (pictured in the centre of the photograph on the left, in a dark grey suit) knew that it was just a matter of time before his past caught up with him. So why did he decide to stand for election in May 2015? Was he so arrogant that he thought he wouldn’t be found out? Did he not realise that being listed as a Councillor would make it even easier for activist researchers to find him? 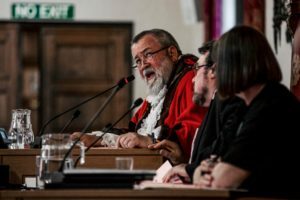 Does he care about how this could affect the reputation of Peterborough City Council, and his colleagues? Did he warn them that this might happen one day? What has he told his friends and family about his past? In 2015, his former employers made a very public apology to women who had relationships like Jessica’s. On behalf of the Metropolitan Police, Assistant Commissioner Martin Hewitt stated that “relationships like these should never have happened. They were wrong and were a gross violation of personal dignity and integrity”. 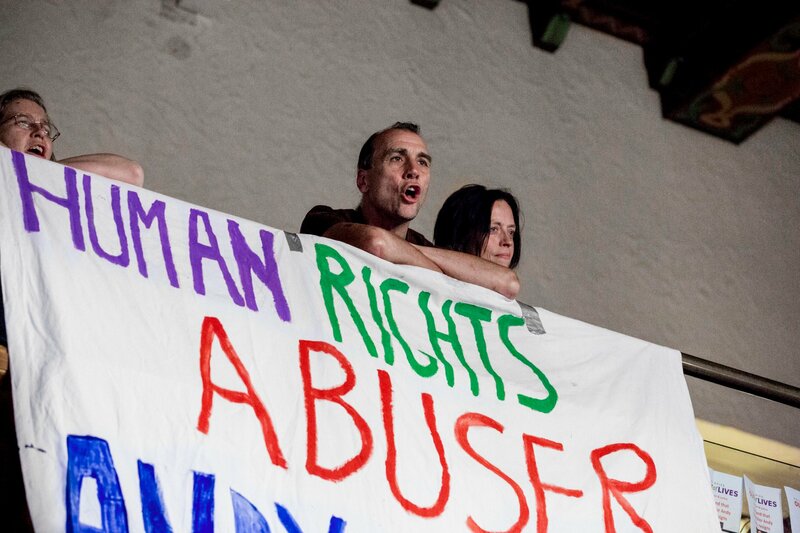 They were “a violation of the women’s human rights, an abuse of police power and caused significant trauma”. The Met described their own officers’ actions as “abusive, deceitful, manipulative and wrong”. Peterborough’s Councillors were forced to have a lengthy coffee break while negotiations went on. Andy Coles was seen coming back into the chamber, despite the growing clamour for him to leave. After almost an hour, the Mayor decided that he’d had enough, and that any attempt to re-start the meeting with Coles present would lead to continuing protest and disruption from a small but determined crowd. He announced that the entire meeting was over for the night, and that they would reconvene on the following Wednesday instead. 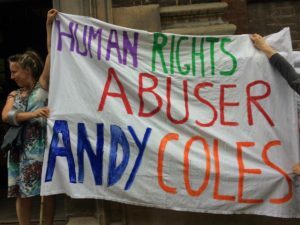 Most of the local protestors have already announced their intention to come back next Wednesday, the 26th July, to make sure that Andy Coles does not continue to go unchallenged. There’s a call-out for more people to come and join them. The Leader of the Council, John Holdich, has announced that they’ve made plans to keep the public out of the gallery next time, and only let them view proceedings via a screen in another room. There will probably be far more than two police officers present. 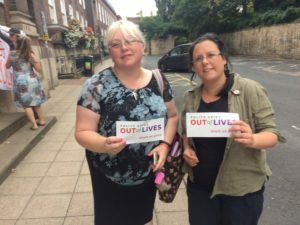 Concerned citizens of Peterborough are planning to organise a petition to the City Council, with the aim of forcing some proper discussion of this issue. They will be working to get the word out on the streets of Cambridgeshire, especially in Fletton and Woodston. Members of the Liberal Democrat, Green and Labour Parties have all offered support to the campaign so far. It was disappointing to see the Lib Dems’ group leader, Nick Sandford, then describe Jessica’s home-made banner as “deeply offensive”. What is truly offensive is the lack of accountability and integrity displayed by Cllr Coles. His stubborn refusal to leave the meeting meant that the entire thing was cancelled, causing inconvenience to every other Councillor and delaying discussion of other important issues. Trade unionists, peace campaigners, environmentalists, animal rights campaigners and others have come together to fight for justice, for Jessica and everybody else who was targeted by these secretive undercover units. This week has shown that when we all stand – or sit – together, we have a lot of power, and we can make sure our voices are heard. Jessica’s voice can be heard here.